In some circumstances, Automatic Configuration may not be able to select a control for the GUI Automation action. 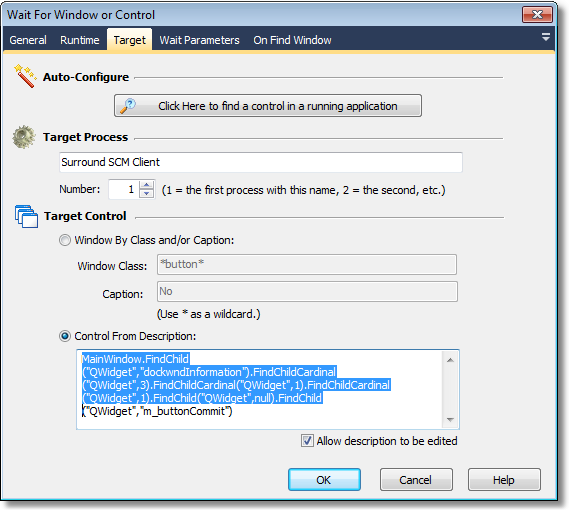 In this case, you can manually edit the fields on the Target property page. Note: It is recommended that you use Automatic Configuration wherever possible. The name of the target process which owns the control. Process names are the same as shown in the Windows Task Manager "Processes" tab, but without the ".exe" extension. Process Number is used to identify multiple running processes with the same name. Number 1 is the first running process, 2 is the second, etc. The numbers are ordered by the start times of the processes - processes which started running first will have lower numbers. Controls can be found in one of two ways : By class/caption, or By description. • The Window Caption. This is normally the text displayed in the window. • The Window Class. This is normally set by the developer of the application. Tip: In Microsoft Windows, the definition of a "window" includes traditional windows like modal dialogs and document windows, but also includes many user controls like text fields, buttons, and toolbars. 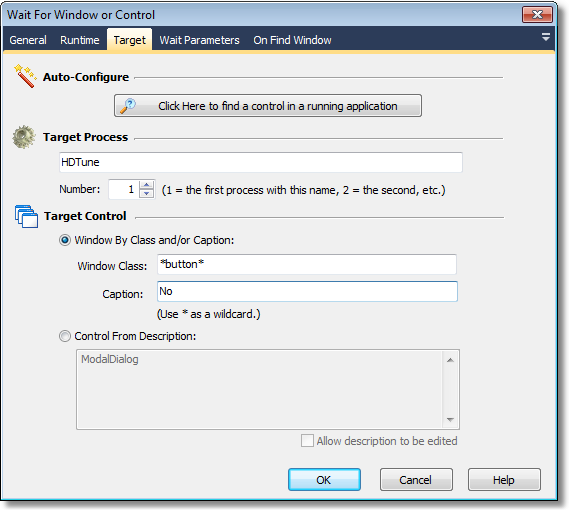 The target window can exist anywhere in the target process. Window classes and captions are not case sensitive. "*" is a wildcard which matches any string. The Control From Description option uses a description string to explain to FinalBuilder how to find the control. The Description is designed to stay valid even if the window is moved around, or if the window is closed and reopened at some time in the future. When you use the Automatic Configuration mode, FinalBuilder generates a Description and populates the Description field with it. 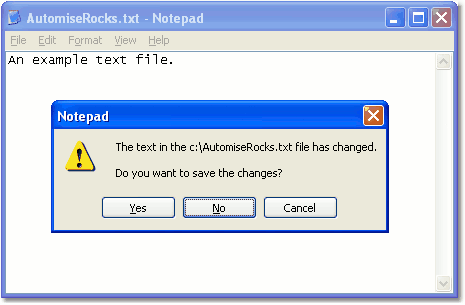 Descriptions are specified using the structure of the FinalBuilder GUI Scripting Model. The full API of the GUI Scripting Model will be made available in the future. Until then, it is recommended that you do not edit the Description strings - just use the Automatic Configuration mode to generate them. Nevertheless, if you want to edit or copy/paste descriptions between actions, then you can do so by checking the "Allow description to be edited" checkbox.